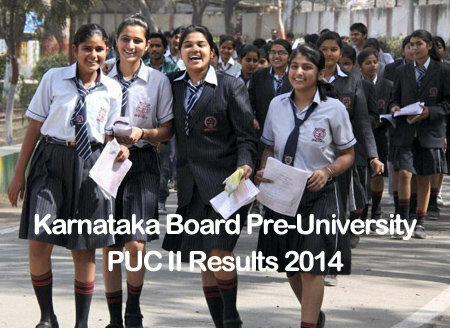 Department of Pre-University Education (PUE), Bangalore is going to announce the Karnataka 2nd PUC Results 2014 on its official website pue.kar.nic.in. As expected, Karnataka Board of Secondary Education (KSEEB) is all set to announce the final declaration of Karnataka 2nd PUC Results 2014 today dated 8th May, 2014 after 8.30 AM. Karnataka 12th Board Exam was conducted from 12 March to 27 March, 2014 at various exam centers allotted within the state and a large number of students appeared in this pre-university examination. More than 6 lakh students had appeared in PU Exam, out of which 1,73,829 students from science stream, 2,05,502 students from commerce stream and 2,41,539 students from Arts stream had taken the Karnataka 2nd PUC Exam 2014 held in March. The official website of Pre-university Education Department is pue.kar.nic.in which will publish the results. Students can check their scores/marks online through this website and we are also providing a direct official link where you can check your board result by entering your roll number / registration number. PUE board had published the Karnataka PUC II Result on 6 May, 2013 at 5.00 PM, accordingly it is expected that the PU 2nd Year Class 12th Results 2014 will be published on or before the 7th May. There is no fixed schedule of result declaration, so we can’t say when it would be available. Keep checking this page for quick updates and reference link to check latest information regarding the declaration of Karnataka 2nd PUC Results 2014. In the coming weeks, KSEEB will announce the Karnataka Board SSLC Results 2014 (Class 10) on its official website. In KSEEB SSLC Exam 2014, around 8 lakh or more students had appeared and waiting for their result declaration. So all the Karnataka Board 10th Class students are advised to keep patience and wait for few weeks, it is expected to declare on or around 15 May, 2014. Freshersplus.com wishing all the best to all the students waiting for Karnataka Board 12th Class Results 2014 and we’re hoping for the best. Good Luck! Whn r v gonna gt results…?? ?